Catholics are obliged to go to Confession at least once per year. However, many people go more often 1 per week, every 2 weeks or every month. The priest is not permitted to reveal your sins to anyone. How Should I Make a Confession? Usually, parishes have scheduled confession times that are written in their bulletins. Or, you might have to approach and ask a priest for a scheduled day and time. If there are regularly scheduled confessions, you might have to line up with others before a confessional and enter when it is your turn. You might enter through a curtain or a small room and kneel down. When you approach as a penitent, the priest might welcome you with words or be silent. Remember: Jesus, the merciful Lord, is present spiritually. In the name of the Father and of the Son and of the Holy Spirit. Then say how long it has been since your last confession. If necessary, the priest helps you with questions and suitable advice. He will ask you to perform a penance, which is usually a prayer. O my God, I am sorry with all my heart for having offended you, and I detest all my sins because of your just punishments, but most of all because they offend you, my God, who are all good and deserving of all my love. I firmly resolve, with the help of your grace, to amend my life, to sin no more, and to avoid whatever leads me to sin. Amen. The priest, might place his hands upon the head of the penitent, or raise his hands in the penitent's direction. in the name of the Father and of the Son + and of Holy Spirit. After absolution the priest continues: Give thanks to the Lord, for he is good. You respond: His mercy endures forever. 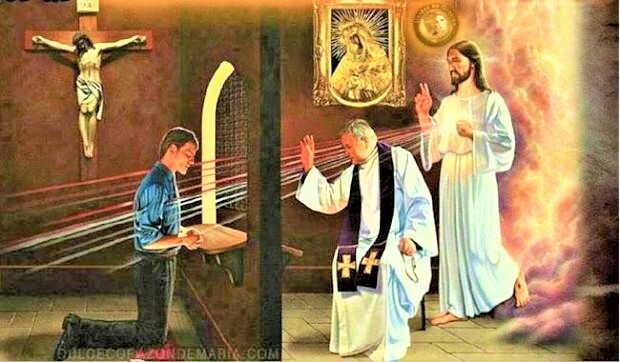 The priest then takes leave of you, saying: The Lord has freed you from your sins. Go in peace. You can say: Thank-you, Fr. Questions to Ask Yourself before you Go to Confession also known as an "Examination of Conscience"
It consists of asking ourselves about the evil committed and the good omitted in relation to God, our neighbor, and ourselves. Do I address God only when I am in need? Do I take part in the Mass on Sundays and days of obligation? Do I begin and end my day with prayer? Have I taken the name of God, Mary, or the saints in vain? Have I been ashamed to be seen as a Christian? What do I do to grow spiritually? How? When? Do I rebel against God’s designs? Do I expect Him to do my will? Am I able to forgive, show compassion for, and help my neighbor? Have I defamed, robbed, or disdained children and the defenseless? Am I envious, wrathful, or biased? Do I take care of the poor and the sick? Am I ashamed of the humanity of my brother or my sister? Am I honest and just to everyone or do I foster the “culture of casting aside”? Have I incited others to do wrong? Do I observe the Gospel’s moral teaching on marriage and the family? How do I handle my educational responsibilities towards my children? Have I refused newly-conceived life? Have I extinguished the gift of life? Have I helped to do so? Am I a bit worldly and a bit of a believer? Do I exaggerate in eating, drinking, smoking, and entertainment? Am I too concerned about my physical health and my possessions? Am I lazy? Do I want to be served? Do I love and cultivate purity of heart and in thoughts and actions? Do I think about revenge or hold grudges? Am I meek and humble, a builder of peace?